July 12, 2016, 10:57 AM · In an effort to promote the coverage of live violin performance, Violinist.com each week presents links to reviews of notable concerts and recitals around the world. 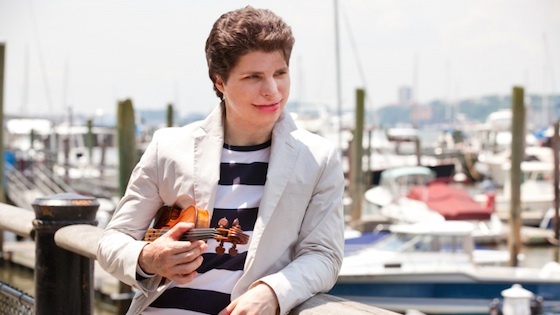 Augustin Hadelich performed works by Telemann, Paganini, Lang and others in recital at Aspen. The Aspen Times: "Wielding a 1723 Stradivarius, Hadelich deployed jaw-dropping technique, lustrous tone and his trademark sensitivity on works spanning four centuries." Nicola Benedetti performed the Korngold with the Royal Liverpool Philharmonic Orchestra. The Guardian: "Nicola Benedetti was the soloist in Korngold’s Violin Concerto, bringing a searing intensity to the lyrical melodies and indulging the hoedown high spirits of the finale with a smile." Joshua Bell performed Saint-Saëns's Violin Concerto No. 3 with the Boston Symphony Orchestra. The Patriot Ledger: "Bell took every chance he could with the dynamics – reaching a point at the climax, which wants to disappear into nothingness, when it actually did. It was one of those moments that separate the great players from the good – Bell, slowing down and diminishing the sound, actually bowed a few notes of the melody that were inaudible. Breathtakingly so." The Republican: "Right from the very first note, Bell sounded spectacular in this dramatic music that seems tailor made for being performed outdoors. At times, Bell's violin sounded like a bird soaring and fluttering through the air inside The Shed. Bell even seemed to conjure a welcome cool breeze during the subtle, second movement." Rachel Podger performed Bach’s Concerto for Violin and Oboe with Maria Raffaele and the Berwick Academy. The Register-Guard: "From the flashy start, it became clear that Podger communicated better with her bow and energetic playing than most conductors with a baton." Martin Chalifour performed works by Mozart, Beethoven and Fauré in recital with pianist Steven Vanhauwaert. Ottawa Citizen: "Chalifour’s sound is huge but never harsh, with elegant, focused vibrato and an exceptionally expressive, soft bow arm. His virile yet debonair playing makes the most of the Stradivarius’s distinctive, smoked caramel voice." Julia Fischer performed a program of Beethoven sonatas with pianist Igor Levit. The Financial Times: "Throughout this concert, the first of three traversing Beethoven’s violin sonatas, it was the Russian-German pianist, Igor Levit, who captivated us the most. Which is quite a feat, given that his stage-fellow was the German violinist Julia Fischer, who sounded, as usual, like she meant business. She gave us poise, impeccable phrasing, a characteristically fearless attack, along with a kaleidoscopic array of colours." These are certainly things to aspire to. But I do kind of wonder how well virility, as that word is usually used, would apply to the playing of a female violinist. The "smoked caramel" voice makes me wonder if the reviewer smoked weed. July 18, 2016 at 06:35 AM · At last, somoene comes up with the "right" answer!